Jacobello di Fiore: Justice between the Archangels Michael and Gabriel. Academia, Venice. 'Yet Michael the archangel, when contending with the devil he disputed about the body of Moses, durst not bring against him a railing accusation, but said, The Lord rebuke thee. Gabriel is never described as an archangel in the Bible. So how many archangels are there? Only the three mentioned above are recognised in the Catholic church. 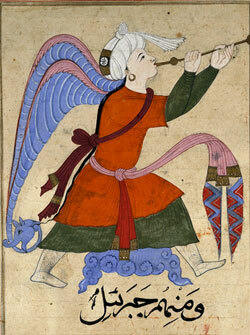 Islam has four, including Gabriel and Michael: other traditions, such as Eastern Orthodox, suggest seven, including Uriel, (mentioned in the apocryphal book of Esdras,) Selaphiel, Jegudiel, and Barachiel. Only Gabriel, Michael and Raphael make regular appearances in art, so I will focus on them. Some traditions hold that Uriel was the archangel that reunited Mary and Jesus with Elizabeth and John (the baptist) after the flight into Egypt, and that this is the angel in Leonardo's Virgin of the Rocks, too familiar to reproduce here. Gabriel is best known for the Annunciation to Mary, and I've written about that extensively here. 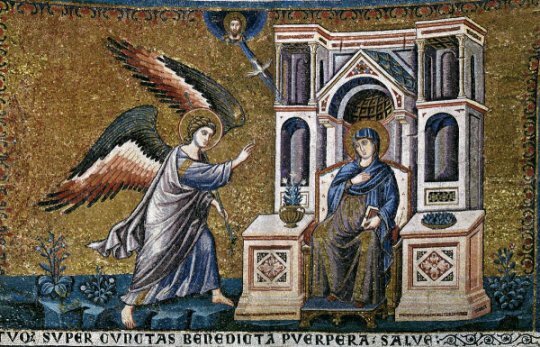 The Annunciation to Zacharias also features in Luke chapter 1, and so the assumption is made that Gabriel was involved here too, but it doesn't say so. He is mentioned in Daniel, Ch 8 and 9. This is Ch 9 v 21: 'Yea, whiles I was speaking in prayer, even the man Gabriel, whom I had seen in the vision at the beginning, being caused to fly swiftly, touched me about the time of the evening oblation.' He appears much more frequently in the Quran: the image on the right below come from a late 12th century Arabic manuscript. As mentioned in the section on the New Testament, Raphael is, traditionally, the angel responsible for the miracle at the Pool of Bethesda. The best known story involving Raphael comes from the Book of Tobit. The canonical status of this text is a matter of debate: It was included in the apocrypha of the King James Bible. It is a lengthy and rather odd story in which Tobias, instructed by Raphael, carries out various miracles using those parts of a fish good cooks normally feed to their cat. 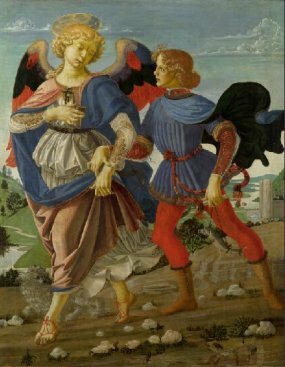 The best known image is Tobias and the Angel by Verrocchio, in the National Gallery, London. Michael is best known in art for dealing with Satan, who appears in various guises. 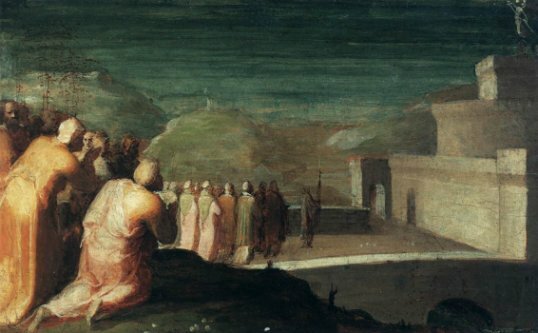 He is also known for weighing the souls of the dead, as in the painting by Juan de la Abadia. I'll be dealing with Judgement day, and the trouncing of the fallen angels, in later sections. 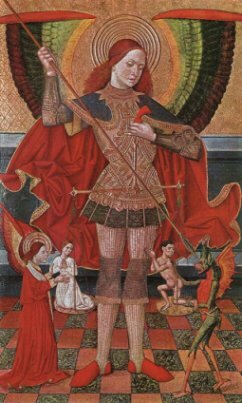 Unlike Gabriel, who retired after his New Testament missions to await the day of Judgment, Michael was kept busy, and St Michael is a familiar dedication of many churches. 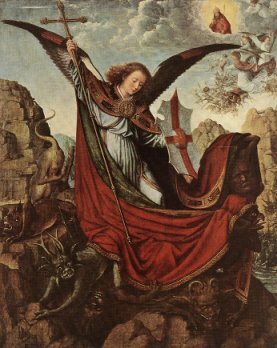 In Catholicism, Michael is responsible for defeating the fallen angels, Judging souls and leading them to Heaven, guarding the church, and fighting heresies. In the Old Testament, he is described in Daniel Ch 12 as the defender of Israel: 'the great prince which standeth for the children of thy people'. There are many legends about appearances of St Michael. I'm going to look at two of them, both favourite places of mine: St Michael's Mount in Cornwall, and Monte Sant'Angelo in Apulia, Italy. Legends tell us that St Michael sat on a throne at the top of St Michael's mount, defending England, and, when not doing that, appearing to local fishermen to warn them of danger. This story was referred to in John Milton's poem Lycidas: 'the great vision of the guarded mount'. What takes the story way beyond Cornwall is a further tradition, included in Jacobus de Voragine's Golden Legend, that Michael was the angel that parted the Red Sea to allow the Israelites to cross. 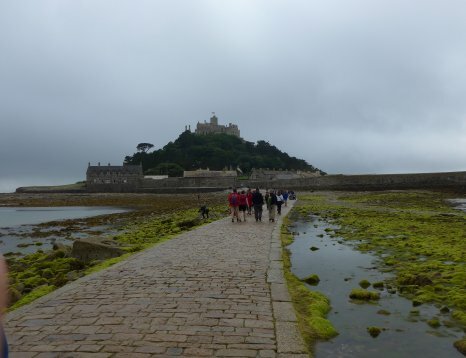 St Michael's Mount was created by a great influx of water; reaching it on foot involves crossing the causeway shown in the photograph above at low tide. It is said that in the 490s St Michael appeared to the Bishop of Siponto, a now abandoned port near Monte Gargano, the hill on which Sant'Angelo nw stands. The archangel offered to defend the local people against invading pagans. 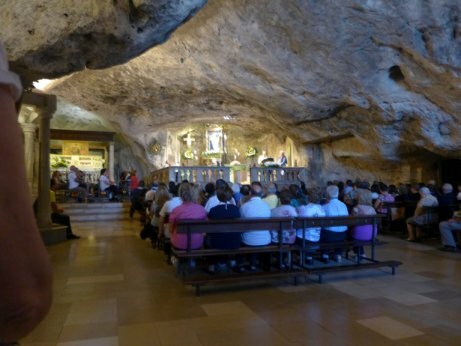 In return the bishop was to dedicate a local cave to Christian worship. This cave, shown above, has been an important pilgrimage site, and a stopping off place on pilgrimages to Jerusalem. It is said that St Francis of Assisi came here, but did not enter the grotto, feeling unworthy to do so. The visitors in the photograph, and indeed my wife and I, had no such compunction. Domenico Beccafumi: The Appearance of St Michael on the Castel Sant'Angelo.